Wahama band students Aaron Beard, David Runyon and Quinel Jones, from left, show off the new instruments purchased with grant money from the Robert and Louise Claflin Foundation. The new horns replace ones that were all over 20 years old. 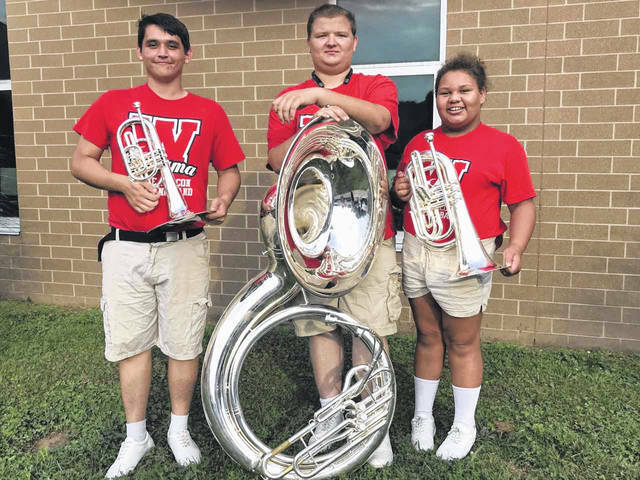 MASON — When members of the Wahama White Falcon Marching Band take the field this year, three of them will be playing new instruments totaling over $12,000. The Robert and Louise Claflin Foundation donated the grant funds to purchase a new sousaphone, baritone, and mellophone. All are school-owned instruments that students are not asked to purchase on their own, due to their high cost. Director Emily Hall said the band members were very excited to get the instruments. She added some of the teens had never seen a brand new instrument before. Principal and former band director Kenny Bond said a sousaphone was last purchased in 1995 while he was directing the group. He stated both the baritone and mellophone were at the school when he started there in 1990. Claflin Foundation President Stephen Littlepage said the grant was really the first of its kind to address a major part of the band. “The Claflin couple was interested in promoting education, and that includes music education,” he stated. Littlepage said he understood a number of the band instruments were in poor shape. He said by using the duck tape, they were trying to hold onto something about to fail, something ready to be discarded. Littlepage continued that the new instruments will not only assist the marching band, but also the band when it enters competition and during concert season. “It was essential to the program,” he added. Littlepage said music education is under the gun in West Virginia, with many schools doing away with band. He said band members not only put in hours and hours of practice for their own program, but serve as morale boosters for athletic teams. “It was a very noteworthy project,” Littlepage concluded. Hall said her next goal is to replace the band uniforms. She estimated the cost to be around $50,000, but added she hopes to start putting back some funds designated toward that goal.